In this episode, Mercurymon tries to convince us that failing at everything and dying was his plan all along. He does each once more for good measure. There have been plenty of bad guys who weren't actually dead and returned to cause further trouble. Myotismon, Etemon and Devimon (sort of) have all done this. Digimon typically has a pretty good track record with managing this sort of thing, throwing them back into the picture in spots that have a lasting impact or at least demand a villain to give Joe and Mimi something to do. It's rare to have a case like this where a character immediately returns for a brief and embarrassing curtain call just for the sake of having a brief and embarrassing curtain call. It's not even that the logic isn't there. Takuya only scanned Mercurymon's human spirit, so of course Sakkakumon has to still be alive. 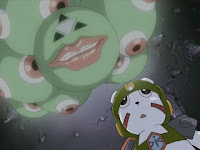 The kids seem to forget or ignore the fact that Sakkakumon was alive in the first place, which given the fleshy décor and all the eyeballs should be surprising. But in truth, Sakkakumon felt like a static landscape most of the time, especially as we only saw the squishy passageways a couple times. Most of the action happened in the ten spheres, so it's easy to forget that this was all happening inside a living thing. A living thing that is back and suddenly very spry! All of a sudden, Sakkakumon is not only alive, but bouncy and flexible, the paths between the spheres apparently able to stretch and collapse to turn this guy into a coiling snake-like creature. It's not a good look for him, to be honest. While the events inside Sakkakumon were disappointing at times, the solemn, intimidating sephirot hovering in midair is one of the lasting images of the series. Even if he remains frightening, it's in a completely different way. Most of the time, he's so agile and jumpy that Sakkakumon now suddenly feels like some sort of amusement park sideshow. The worst part about it is that he's pretending that this was what he was shooting for the whole time. We're supposed to believe that he deliberately put beatable opponents inside his spheres so that he could scan a bunch of attacks for later use. Not only that, but in the process, he willingly gave up both the human spirit of steel and (and this is the key one) Seraphimon's data? From what we've been gathering, Mercurymon appeared to have his own ambitions of conquest beyond his loyalty to Cherubimon. He wouldn't have tried withholding Seraphimon's data to help a collective cause; he has purely selfish notions. It's safe to say that he's not simply sacrificing such critical data, and good luck conquering the Digital World in his beast form. Once you get past all that, the episode's just fine. Mercurymon's ability to reflect attacks has always felt like the most dangerous thing in his arsenal, so Sakkakumon having the ability to not only amplify reflected attacks but initiate ones he's learned is a legitimate threat. The kids certainly don't know how to handle it. While Takuya seems to have learned his lesson about retreating against dominating opponents, something that was probably supposed to be a point of emphasis here even though it was JP's idea, they end up in a bigger bind. Pro Tip: When running away, don't get chased into the dead end of a dark cavern. After some frightening, albeit forced, moments where Sakkakumon taunts them in the darkness, Takuya seriously earns some leadership points. It's always good to see our goggleheads actually take the reigns and be proper captains, especially Takuya who hadn't done it much before. 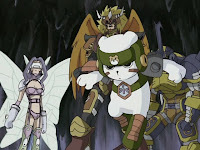 He calms his troops down, tries to teach them to use the heightened senses they have as Digimon, and organizes a counter-attack that brings Sakkakumon down. While Mercurymon ultimately has to be considered a disappointing villain who squandered some serious opportunities, at least he forced Takuya to step up. In the opening recap, Rika asks what use Patamon could possibly serve against the forces of evil. This is not only hilariously ironic, it may actually be a character factoid for Tamers: I am now thoroughly convinced that Rika never actually watched the Adventure anime like Takato and Kazu had. She only played the card game. When Sakkakumon floats off, everybody's relieved except JP, who totally predicted that it would return. I don't feel like busting out the stopwatch again, but it feels like not only are the transformation sequences in this season longer, but they show the full routines more often. Zero Two and Tamers frequently opted for abbreviated versions and split screens, which should really be mandatory anytime JP, Tommy and Zoe all spirit evolve together. For all the credit Takuya deserves for beating Sakkakumon, the incessant attacking in the early skirmish is downright stupid. Rather than trying to think about an attack someone may not have used inside Sakkakumon, they just throw everything at him and see if there's something he doesn't reflect back at them. There isn't. As incompetent as he got towards the end, I love that Sakkakumon surrounded the kids while they were huddling up to plan an escape. Who says talking is a free move? 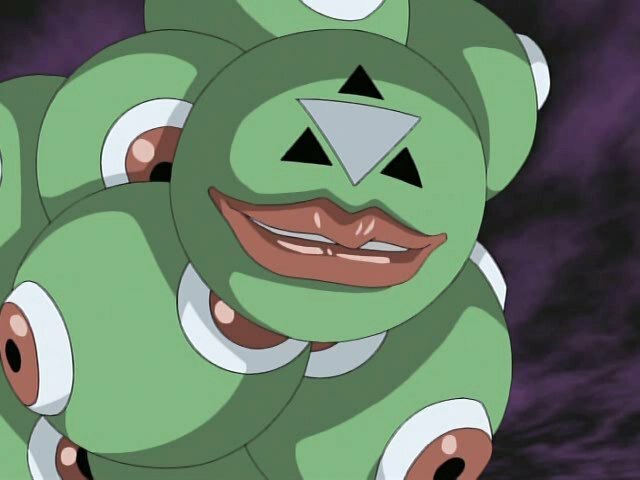 Cherubimon says that Sakkakumon is the last warrior to be destroyed. Either the dubbers forgot about Duskmon or Cherubimon openly recognizes that Duskmon is a special circumstance. It's a strange case where it's either a mysterious, thought-provoking note or... silly dub. I actually watched some of this season subbed, and yes they actually did make the transformation scenes longer for the dub. Probably to pad the season out even longer. Rika thinks cartoon shows are stupid. This is now part of my head-canon. 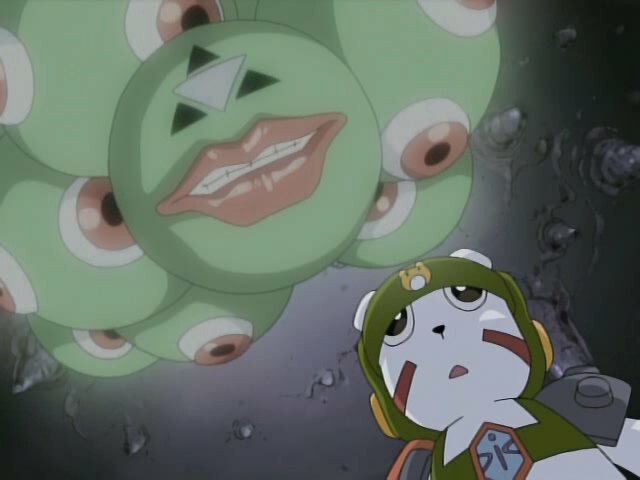 When I first saw this episode, Sakkakumon coming to life creeped the Hell out of me for some reason. I agree losing Seraphimon's data was dumb, but I think the plan might have been salvageable as far as his Human Spirit was concerned. Once he destroyed Takuya, he could simply reclaim his Human Spirit. There's no excuse for wasting Seraphimon's data like that, though, especially since the plan seemingly involved giving it back to Patamon in the first place. It might have worked if he had killed Patamon and reclaimed the data, but there's no indication in the episode that he even acknowledged this plan. Also, Sakkakumon suffers from the same problem as many other villains: getting overly chatty to the good guys. Stop talking and showing off, and just destroy them! The only way this episode could have mase sense is if Mercurymon stored the data of Seraphimon somewhere or didn't use it and that even though Takuya beat the crap out of his Human Spirit, he could have said that this "taking attacks from everybody" plan was his backup in case his original plan failed. But it didn't and its a shame.